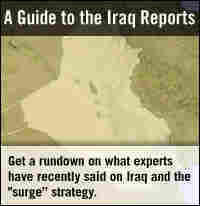 Bush Set to Brief Nation on Iraq Plans President Bush will address the nation Thursday night. He's expected to announce the beginning of a drawdown of U.S. troops from Iraq — including 5,700 troops to be pulled out in December. President Bush will address the nation Thursday night. He's expected to announce the beginning of a drawdown of U.S. troops from Iraq — including 5,700 troops to be pulled out in December. It has been a week of testimony and talk about the war in Iraq. And tonight, President Bush will address the nation in primetime. He's expected to formally endorse the recommendations of his top general in Iraq, David Petraeus. But he will do that, senior administration officials say, without going into much detail. NPR's Don Gonyea is at the White House. And, Don, you've been to some of those background briefings. What do we know about what the president will say regarding troop levels? DON GONYEA: Well, first off, anyone looking to hear firm numbers tonight regarding troop levels into next year will be disappointed. We are going to get one specific number. Some troops will be home by Christmas - a senior administration official is telling us the president will announce tonight. Fifty-seven hundred troops home by Christmas, people who will be coming home and who will not be replaced by new troops in Iraq. But after that, I mean, there are a lot of numbers out there but you won't get them from the president. You've heard that number - that maybe 30,000 would be coming home from Iraq by July. Well, White House says that's not their number, none of those other numbers out there are theirs. Instead, what they're talking about are brigades. A brigade is roughly thirty-five hundred. So they are saying that they want to reduce the current number of brigades, 20 down to 15. But, again, the White House is not even putting a timeline on that, and they stress they're only talking combat troops. So if we do the math, instead of 30,000, maybe it's 21,000, but the White House won't even be pinned down on that. NORRIS: So, Don, beyond the troop numbers what broad themes might the president lay out? GONYEA: You will hear a lot of talk about success, so far, in Iraq - success of the troop buildup, the surge. Now, it's not political success in terms of getting the Iraqi government fully functioning and getting reconciliation on the path toward where things can function more smoothly. But the message will be that the surge has been a military success. And expect lots of talk about Anbar province where the president made that Labor Day visit last week, where the Sunni tribal leaders, once allied with al-Qaida, decided instead to work with the U.S.
And it's true, violence has been way down in Anbar province. The president is going to highlight that and say that can be a model for the rest of the country, but - and it's a big but - there's also bad news out of Anbar today. One of those tribal leaders with whom the president sat down was killed today when a roadside bomb blew apart his armored vehicle. NORRIS: And we should note that the president actually met with the Sheikh Abdel Sattar Abu Risha on a number of occasions. GONYEA: Exactly, last weekend and on previous occasions. And this is really a blow to the U.S. He was a critical ally. The president is going to pay tribute to the sheikh tonight. But it also serves as a reminder in the midst of a speech that will try to focus on the positive just how dangerous and how volatile things still are there. NORRIS: Now, this is not the first major primetime speech on Iraq the president has delivered this year. It was back on January 10th that he first announced that there would be a troop buildup, what's come to be known as the so-called surge. Before we go on, let's listen to something that the president said back then. 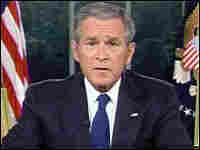 GEORGE W: America will hold the Iraqi government to the benchmarks it has announced. To establish its authority, the Iraqi government plans to take responsibility for security in all of Iraq's provinces by November. To give every Iraqi citizen a stake in the country's economy, Iraq will pass legislation to share oil revenues among all Iraqis. NORRIS: Now, Don, clearly those benchmarks have not been reached. What will the president say about that tonight? GONYEA: It's probably the toughest part of the speech. He will basically say that from January, when that speech was made, to now, it just hasn't been enough time, but that doesn't mean that the U.S. should give up, that there are other signs of things going well, so it's important to keep moving forward. NORRIS: And just speaking of signs of things going well, any evidence that the president's efforts, that tonight's speech, his trip to Anbar, is swaying public opinion? GONYEA: He's gotten a slight bump up in the polls - 30 percent approve of his handling of the war now. That's, again, a bump upward, but that's still very low. Mostly he just needs to convince some moderate Republicans not to bail out on him. NORRIS: That was NPR's Don Gonyea speaking to us from the White House.